Having your own app available in the app stores with thousands or even millions of users, is the dream of most developers. Well and frequently used apps offer their owners the possibility to earn a decent income. 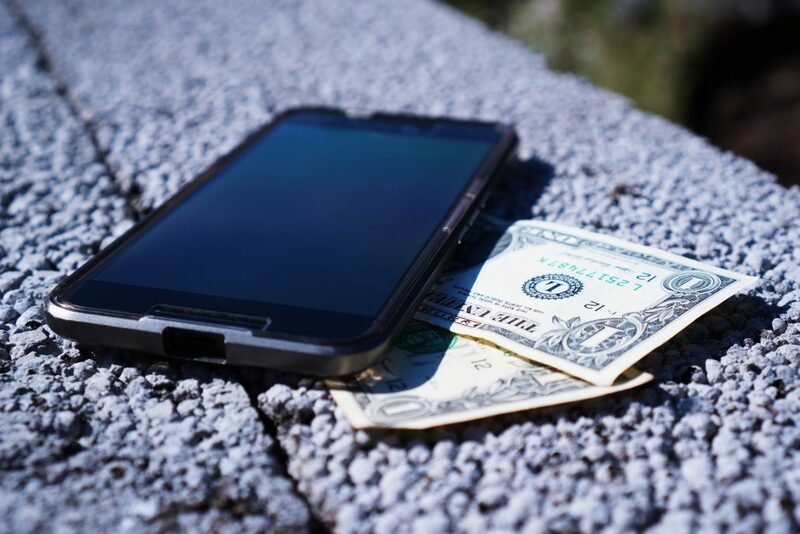 In this article, a general overview of the different available monetization models and their considerable positive and negative aspects are expounded. What is the purpose of the app and how does it solve its tasks? What is unique about the app and to what extent are users willing to “pay” with money or engage with an ad? What are the competing apps in your field doing to monetize their assets? You should keep in mind to balance your effort in acquiring new users compared to earning revenue. Some apps can be monetized directly after the user installed them, while other monetization models work more adequately when the user is given time to engage with an app, before the developer can use its potential. The developer can decide on how his/her timetable and whether or not the possibility to decrease revenue initially in order to accumulate new users is a good plan of action. Developers should decide on and integrate their monetization method before launching their app in the app stores. 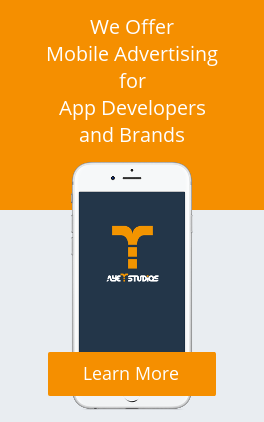 This way, the app can be both a useful tool for the user and a business for the developer. In most cases, the possibility to mix different monetization methods to maximize the revenue turns out as advisable. This is probably the most straightforward monetization model. It simply states that your app is not free, if a person wants to use it, he/she has to purchase it from an app store. Hence, the developer makes a profit right when the app is installed. For paid apps, it is extremely crucial to have an appealing app store page along with a unique name, interesting screenshots and a well written description, pointing out significant benefits. If you’re interested in-app store optimization (ASO), read our comprehensive article. The advantage of this monetization model is that developers earn money with every download, and users are more likely to engage properly with the app since they already spent some of their money for it. Furthermore, paid apps possess the possibility for a cleaner interface because no in-app advertising is needed. Attributable to the high competition within app stores, paid apps have to be more innovative and fulfil their purpose flawlessly, serving the user’s anticipations. The negative side of the paid app monetization model is the fact that the app stores are already crowded with (good) apps for nearly any purpose. In most cases, there is also a free app, which does a specific job similar to its paid counterpart, but with a different monetization model. 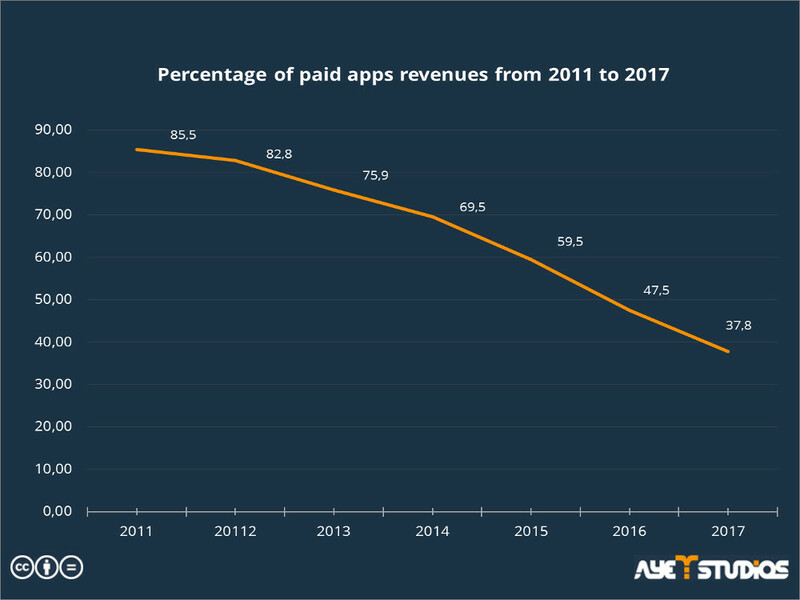 Over the last years, paid app monetization models are a shrinking part of the app store revenue. This monetization model allows developers to offer their app in the app stores for free. The goal for the developer is to gain a decent user-base and gather user information and information about the users’ interactions within the app. The collected data is sorted and sold to advertisers specialized in targeted ad placements. A good example for the ad revenue monetization model is the social media platform Facebook. Facebook’s users do not pay directly to use the platform, but their data is used to sell highly targeted advertisements. App developers can choose from a broad variety of ad formats. There are different options for the publisher (developer of the app) to get paid when implementing advertisements on his/her app. For example, a publisher can be paid if a user sees a banner while using the app, but there are also cost models where the advertiser only pays the publisher after a certain action was taken by the user. If you want to know more about the different cost models, feel free to read our article. The negative side of the ad revenue monetization model is the fact that it is not very innovative in its form and the publisher runs the risk of annoying his users with ads, who will then stop using the app as a result. App developers also have to think about which ad format to choose, because the space on the screen is limited and oversized ads could be recognized as disturbing by the user. Some developers also choose to implement an option for the user to make the app ad free. This is another version of the app: ad-free and with a price tag. Another possibility would be for the payment of the “ad free fee” to be inside the app. Some publishers integrate an option where users can pay directly in i.e. Euros or Dollars, while other publishers decide let users pay for the ad removal with an integrated in-app currency. You will learn more about in-app currencies later in this article. Freemium is a cross of the words free and premium. With this monetization model, the user can download and try an app for free, but some parts of the app are separated with a paywall, meaning the user has to spend money in order to get the full version of the product. This monetization model works great with mobile games, where, for example, the first levels are free, enabling the user to get to know the game and its mechanics. At some point, to continue playing or to unlock more levels he/she has to pay. The more the users engage with the game in the beginning and the more fun it is, the higher are the chances that they will turn into paying customers. This monetization strategy allows you to tease users with a “light version” of your app and hook them so that they buy additional features. Freemium developers can showcase their apps and get a large engaged user base. The difficult part is to find the perfect spot between too little free functions (the user does not engage properly) on the one hand, and too many free functions (the user sees no point in paying for additional content) on the other hand. Consumables are bought by the users any time they want them and cannot be downloaded twice for free. These consumables could be game currencies, game hints, extra health or lives in a game, extra experience or a package of exports to a new file format. These are extras connected to your account. You buy it and you can use it forever. In addition, the non-consumable stays with your account if you change your device or reinstall the app after a break. This could be the upgrade to a pro edition of an app, the removal of ads, full game unlock, unlimited hints, extra characters, extra accessories, bonus game levels, city guide maps, etc. The positive side of this monetization method is that if you have programmed a good app that users like to engage with, you can generate revenue during a long period of time. Additionally, this kind of monetization is quite risk free, because only engaged users are paying for it and there are no additional marketing costs. It is important to note that users, which have already made an in-app purchase, are more likely to have a higher retention. The negative side of the in-app purchase is that the app store usually takes a cut of the generated revenue. In some cases, in-app purchases have a bad reputation, especially in the gaming sector. This could be extra content, which the user can get access to for a fixed period of time. Users can renew their subscription when the preset period is over. A very good example is the subscription for a streaming app. This subscription model also buys content for a specific time frame, but will renew itself automatically at the end of each billing cycle. For the subscription to end, the user will have to terminate it. Some good examples for this method is a newspaper subscription or the subscription for a streaming platform like Netflix or Hulu. The beneficial side of a monetization model based on subscriptions is that subscribed users are in general more loyal and will return frequently. In addition, it generates a constant revenue flow throughout the year. The downside of this model is that it is not suitable for all verticals and categories. App developers can also choose to reward their users for interacting with an ad. This could be an extra life for a game or some boosts or hints in a game, or even discounts in a shopping app. Advertisers look out for publishers with a decent amount of traffic and pay them i.e. for installs, subscriptions or views of a video clip. The publishers display the ads to their user bases and reward them for interacting. You can get a more detailed overview of incentivized and non-incentivized advertising here. On the positive side, rewarded advertising offers the user a real value while the publisher also generates revenue at the same time. However, not all rewarded advertising methods are suitable for every app. For example, if there is an offerwall in a mobile game, the users do not want to exit the game just to earn the in-app currency. For games, rewarded videos or interstitials seem to be the most fitting model. The trend seems to go in the direction of blended models of app monetization. Thus, the combination of two or more monetization models seems to be useful, although it will not fit every kind of app. You might on the one hand integrate a banner advertising SDK and also make it freemium. However, some monetization model combinations do not work well. For example, if a user already made a subscription and pays a monthly fee to consume content, he/she will likely be unhappy with interstitial or video ad interruptions. We would like to invite you to use our SDK and earn money with your users. We at ayeT-Studios developed an easy-to integrate SDK with a lightweight filesize of only 175kb. It is completely free to use and you can start to earn money very fast. Click here and start generating revenue!